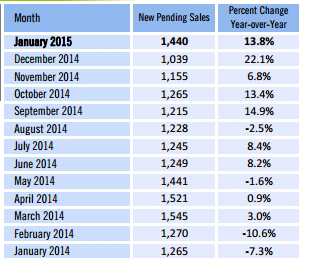 Southwest Florida real estate pending sales increase was up 13.8% in January over last year. This is a positive sign moving forward. Ironically closed sales were also up 13.8% in January over 2014, so February and March sales could also be up when those numbers are later released. Last December we wrote an article titled “Here Comes the Listings, Here Comes the Sales” The gist of that article was that we could sell more properties if we just had more listings to sell. We don’t have a demand problem, more like a supply issue. In October and November we noticed listings had picked up so we speculated sales might pick up, and it was true. 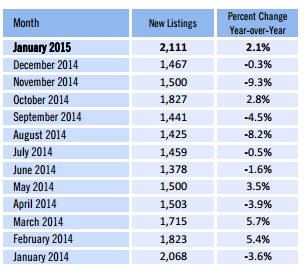 In January 2015 new listings picked up to 2,111. We haven’t cracked 2,000+ since January 2014. If you look at new pending sales from last year, they really kick into high gear in March, April, and May. We could very well see that again this year. It’ll be interesting to watch sales numbers come out for February. If history holds true, new listings will decline a bit in February and March while pending sales may begin to rise slightly in February and make a big jump in March. We think this may hold relatively true again this year. Buyers seemed to lack urgency in February but we’re noticing urgency in March. Buyers are more serious and the contracts are coming in. We won’t focus so much on the February numbers as they may be flat or up or down somewhat. We’re really focusing on what happens in March. Those numbers won’t be released until about April 21 or so and that’s when we’ll get a good indication of the market. Cash buyers are picking up again too as is usual this time of year. Cash sales are up to 49.6% of sales which is down from 56.1% January 2014. We expect these numbers could rise in February as well because they did last year. Median sale prices were up 5.6% in January to $190,000, up from $179,950 the previous year. Median days on market are down to 39 days. It was 46 days January 2014. This suggests a strong housing market. Most economists predict good times ahead for Florida for the foreseeable future. If you’re thinking of selling check out our online home value tool at www.Topagent.com It will give you an approximate estimate of your home’s value. Of course, there is no substitute for a professional viewing your home on the inside and comparing against similar sales. We can do that too. Simply call us at 239-489-4042 and we’ll be glad to schedule an appointment. If you’d like to search for your next home or condo in SW Florida, you can. It’s online. It’s fast, free, and easy to use, and the best part is you can do it anytime day or night. Just go to www.Topagent.com and begin searching. As always, if you have questions we’re here to help. We know you may just want to search on your own and not talk to anyone yet. Everyone is at a different part in the decision process. We’re here to help even if you’re just thinking if it’s possible all the way to I need to buy today! Either way you’ve probably got questions and we’re happy to answer them. No pressure.